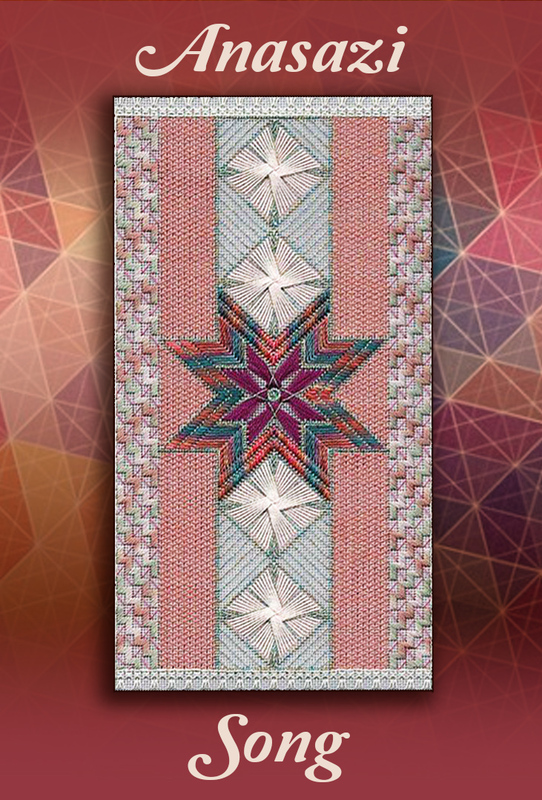 ‘Song’ includes a variety of composite and pattern stitches, beginning with the central star, worked in a multiple cross pattern within a star of stepped oblong crosses. Other geometric stitches include Burden, Altered Byzantine and double fan doubled. Borders of complex crosses complete the piece, which is outlined with a combination of sprat’s head motifs reminiscent of Anasazi motifs. Stitched on 18-count Pewter canvas, Anasazi Song uses Watercolours, Kreinik #8 braid, overdyed floss, Impressions, Flair, Grandeur and Elegance.